The Perfect Caulk Cutter is the ideal tool to make working with caulk easier and less frustrating. 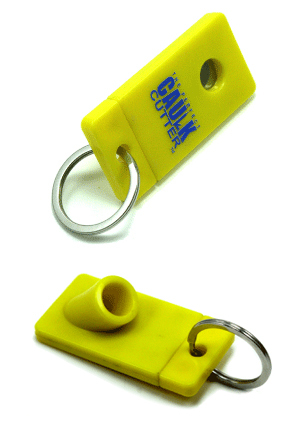 It is a key chain tool that precisely removes the tips from standard 10 oz. tubes, at the ideal angle and depth. It takes away all of the guess work, and provides you with a precise and compact tool to do the cutting. You will guarantee that each tube of caulk is opened identically thanks to the ingenious design, and since the blade is super sharp, and incredibly precise, you will also ensure a smooth, and perfect slice. The result of this increased accuracy and precision when removing the tip is perfect width when applied, and quicker, easier and more professional results each and every time you lay down some caulk. The key ring makes it easy to keep this compact tool close at hand. Professionals will want to place it right on their key chain for frequent usage, but casual home users may want to attach it right to their caulk gun, or hang it in a convenient place in a tool box or around a workbench. One of the most frustrating aspects of working with caulk is how much you go through. In the course of one job, you may use 5, 10 or even 20 tubes. This is why having a good tool to remove the tips can be so handy. It will make it easy to open all of those tubes, but also ensure that each one is opened in the same place, and at the same angle. For larger, continuous jobs, you will easily keep the same caulk width to achieve professional level results that have a uniform look. 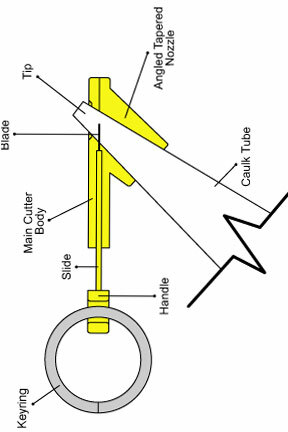 Anyone can use it because it's as simple as slipping in the tube and then pressing down the cutter. The tapered shaft that the caulk is inserted into will perfectly align the tube with the cutting blade. You can only insert the tube to a certain depth, so there is no measuring or guess work involved. The sharp blade will easily cut off the tip to reveal a smooth, straight cut. You can accomplish the task much quicker, and you will never have to use the lines on the tube as a guide, spend time trying to find the right spot, or adjust for the correct angle. Stop struggling with scissors and knifes when opening tubes of caulk, and forget about fancy tools to clean up messy caulk jobs. Approach the job with a better tool and you are guaranteed better results. When you are using a tube of caulk that has a perfectly cut tip, it will be much easier to achieve professional results while caulking. Do the job right the first time, so cleaning, smearing, spreading and scraping after the fact will no longer be necessary. When you cut with a knife or scissors, you are forced to perform guess work, and hope for a precise cut. With the Perfect Caulk Cutter there is no question. If you are using it, you will easily make perfect cuts each and every time. Since it is so compact, and also attachable by key ring, The Perfect Caulk Cutter is an incredibly useful tool that you will use time and time again. Using this tool is easy. It works with all standard, 10 oz, tubes of caulk and allows you to acheive a perfect 1/8" thick caulk line. To remove the tip from a tube in order to open it, simply slide open the tool to reveal the hole for the tip. Insert your tube of caulk into the tube as far as it will go. Since it is tapered, it will stop at the perfect spot for cutting. Once you have the tube in there, simply press down to close the tool and cut the tip. You can use one hand, or two when cutting the tube. For easiest results use the thumb and forefinger of both hands to close the tool by pinching with one hand on either side of the cutter. The simple design ensures a perfect slice each time, so you can open tubes faster and with more precision all at the same time. This ridiculously useful keychain tool would make a great addition to anyone's pocket, and will save you time and aggravation on your next job involving caulk. It makes a perfect gift, and has proven to be a high quality tool. Order just one, or get more for an even lower price. Receive free shipping on any quantity. Order Yours Today! Dimensions(closed) 2.6" x 1.25" x 1"
Dimensions(open) 3" x 1.25" x 1"
Uses Remove tip from 10oz caulk tubes. 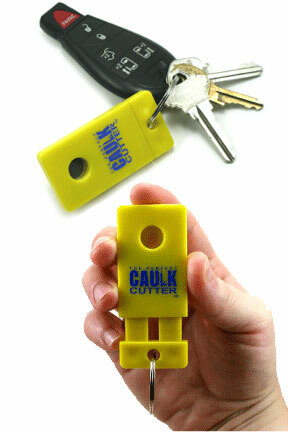 Perfect Caulk Cutter Keychain Tool - Working with caulk has never been this easy or precise. Cut tubes in the perfect spot and at the perfect angle. 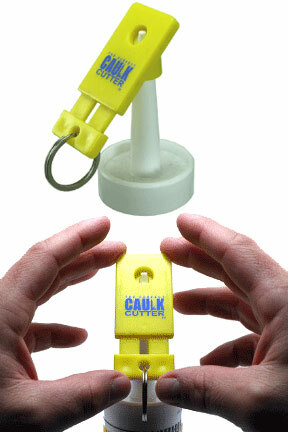 This easy to use little tool will make it quick, easy and fool-proof to take the tip off of tubes of caulk. This cutter is very safe and works good for laying a small bead of sealant. It would be nice it there were a larger opening size cutter to fill larger gaps. The calk cutters werent has good as the other cutter I have but it does get the job done. I bought more than one this time so that way i will always have one in the future. Good product.